Tuesday was always a bee group day. For years I quilted with my mom and some of our friends. Most of the ladies are not around for the winter months. Darn snow birds. While I still quilt on Tuesdays but it is often work doing my customers machine quilting. 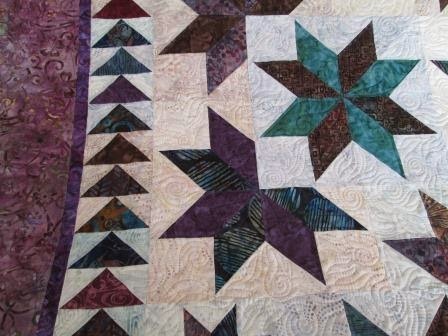 This is a customers star quilt all with batik fabrics. I just had to show you what I did. She was very happy with it. This is a shot of the backside of the quilt. You can see what I did on the star blocks. I wanted to be sure I had a photos of this. I want to remember what I did for the star. Both the quilt and the quilting are gorgeous. Ditto BillieBee. In your line of business you should have pictures to show perspective customers... well, you just did. Cathy, your quilting really accents the beautiful top! Cudos to you and the quilt maker! 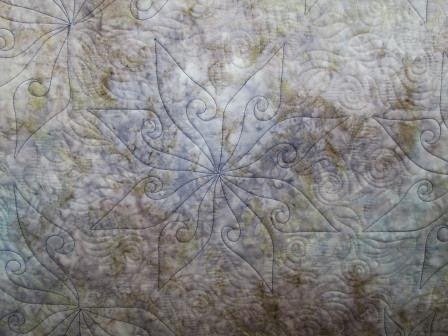 Love how you quilted the star! Maybe you'll just have to join the snow birds one of these days!